For cats, sharpening their claws is an instinctive behavior. If your cat is not supplied with a viable and preferable alternative, he is likely to choose your couch or your carpeting as a scratching post. What Is the Imperial Cat Zen Scratcher? The Imperial Cat Zen Scratcher is a great solution. Made of a thick and durable cardboard-like material, the scratcher is a “green” product. The curved, undulating design of the scratcher is made in such a way that cats can play on the scratcher or relax comfortably on it. The design also includes holes in the surface of the scratcher where catnip can be sprinkled, adding to the enjoyment of the scratcher for many cats. For the purpose of full disclosure, I need to tell you that Imperial Cat supplied me with two of these scratchers in consideration of writing a review. In all honesty, once I had seen the scratcher in action, I was more than happy to provide the review. Of the two scratchers that Imperial Cat supplied to me, I kept one for my cats and gave one to my mother for her cat. My mother calls hers “Sunshine’s couch.” Sunshine, of course, is her cat and she spends a large part of her time on the scratcher. She tends to lounge more than play on it but she does play as well. And, naturally, she scratches. My cats also enjoy the scratcher though they tend to play on theirs moreso than lounging as Sunshine does. My cats particularly enjoy when I sprinkle catnip over the scratcher. The catnip falls between the cracks in the scratcher and rests on a cardboard piece on the bottom of the scratcher. If you purchase the scratcher, do not remove the cardboard piece from the bottom or the catnip will fall through to the floor. 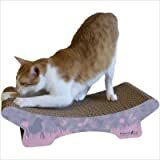 This particular scratcher is more suitable for those cats that prefer a more horizontal surface to scratch on as opposed to a vertical surface. However, Imperial Cat does make other models that are more vertically oriented. One of the things that I was initially concerned about when I first received the Zen Scratcher is whether it would stand up to the activities of six active cats. However, it has been in use for many months now and is showing very few signs of wear and tear. Overall, it has held up quite well. Who Could Benefit from the Zen Cat Scratcher? 01141MD Features: -Cat scratcher. -Attractive, modern design complements home d cor. -Includes a bag of certified organic catnip. -Made from 100pct post-consumer recycled paper. -Printed with soy-based inks. -Dimensions: 6.25” H x 22.25” W x 8.75” D.
Find more Zen Cat Scratcher products on Amazon!